« Children’s Christmas Party – Who’d have thought it???? The Tenterfield Show was on this week end. 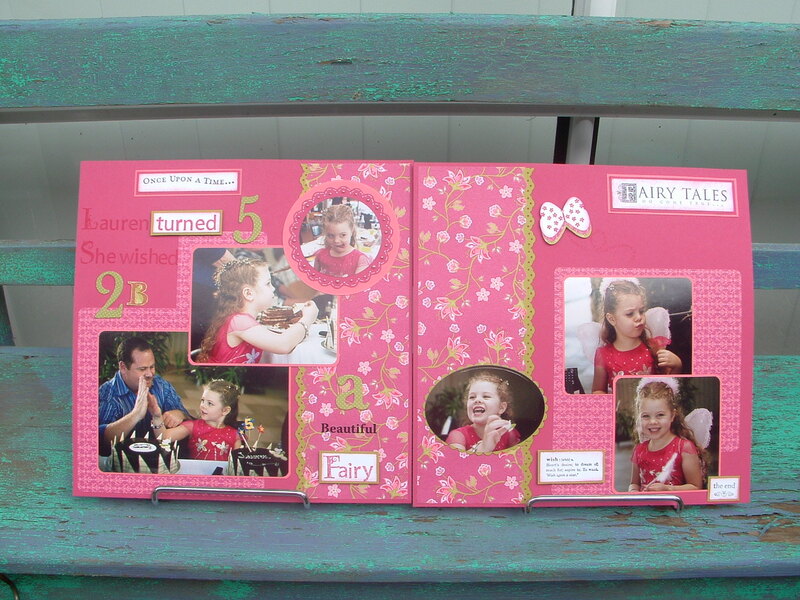 I decided to enter two pages into the scrapbooking section. They included this one and my previous entry of Funny Face (see two blog entries back). I had to have a friend pick my stuff up from the Show office as I was in Brisbane for the week end. He just arrived here with the great news. I won first and second prize for my entries. I would dearly love to know how the judges arrived at their decision. (not that I mind which one took the 1st prize) I’d just like to know what they were looking for. I also won 1st and 2nd prize for my cards however I’d entered five cards and they just arrived home in a bundle, so I’ve no idea which one won and which one came second!!!!! ……and I received a second for a decorated tin which I’d entered into the ‘Recycled’ Class. All that mumbo jumbo aside. The delightful child in this layout is my “step-grand-daughter”. The first page shows her with her Dad (Jason). It was her 5th birthday and she dearly would like to have been a ‘fairy’. Need I say more??? I had left a space for a journalling block on the second page. Since I wasn’t at the birthday I didn’t feel I could journal what happened. I was leaving that to her Dad. The judge’s don’t seem to have minded the blank space. Hi Jacqui…..congratualations for your wins at the show. 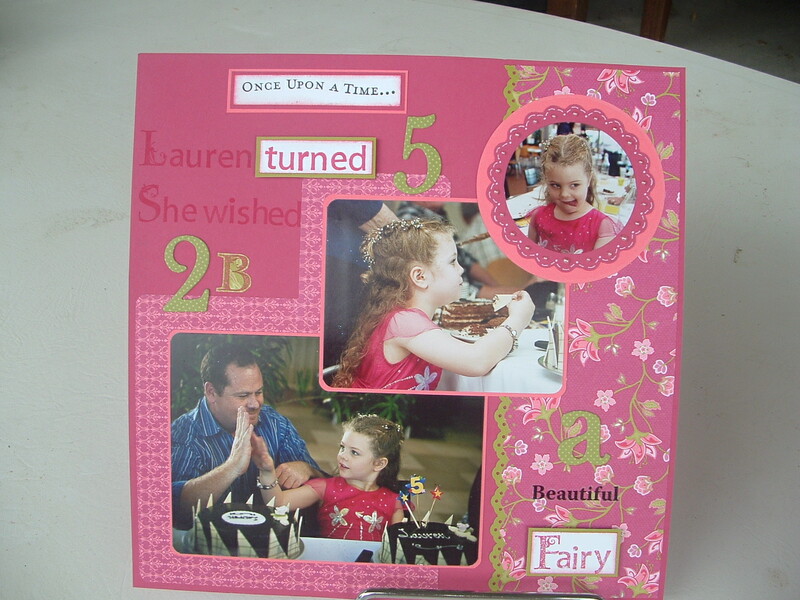 For someone who keeps saying they haven’t done much scrapbooking this must have come as a great surprise to you but should inspire you to do more pages with confidence. The pages I have seen of yours on your blog etc have been great. 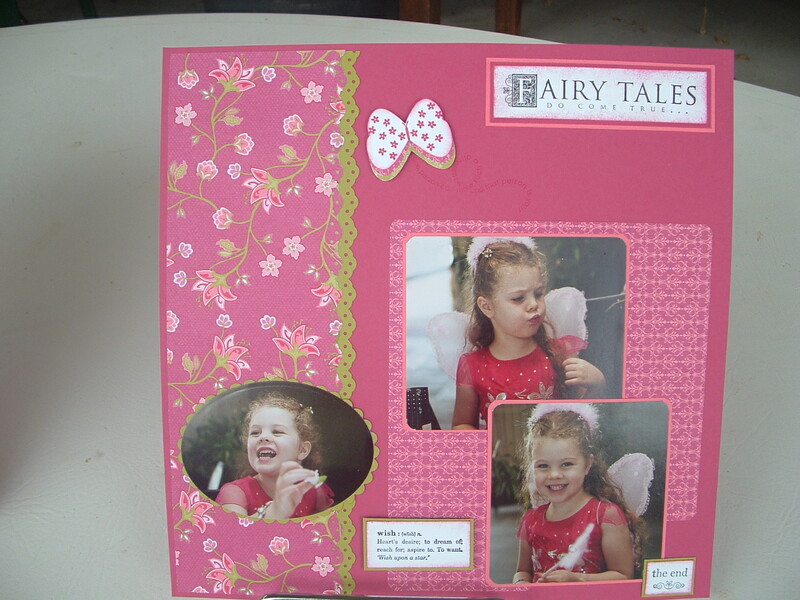 Are you doing classes for scrapbooking yet? Congratulations Jacqui. Well done on taking out the two top places. Love the fairy pages. They are a real “show-stopper”!! (sorry, for the pun, humor is not my strong point).